On January 6, 2017, the Firm hosted the Chicago Bar Association’s Lawyer Engagement and Development (L.E.A.D.) Committee which engages associates at mid-to-large law firms. The meeting focused on leveraging pro bono work for attorney professional development. Associates from a number of Chicago firms were in attendance. 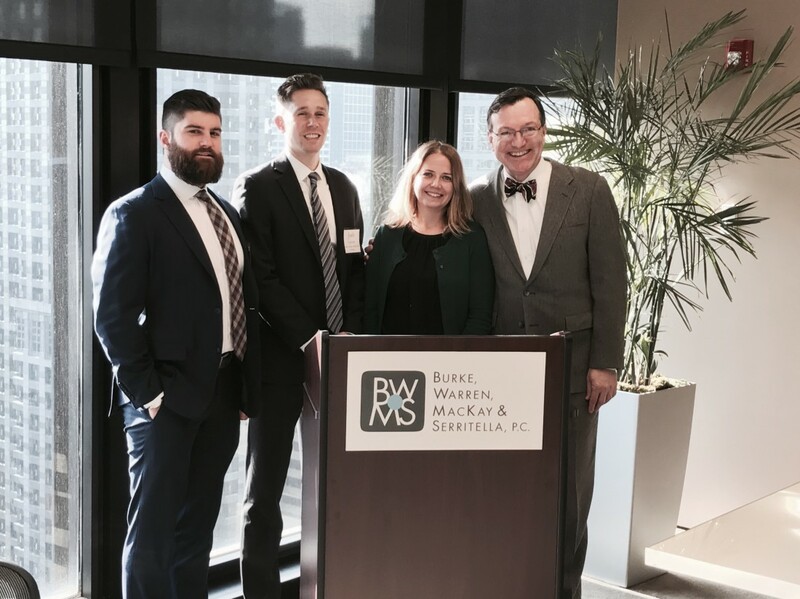 Pictured from left are Firm associates Jim Murphy and Josh Cauhorn with panel speakers Kelly Tautges of the Chicago Bar Foundation and Judge Thomas M. Donnelly of the Circuit Court of Cook County. Also on the panel were Howard Jeruchimowitz, pro bono director at Greenberg Traurig and Gabriel Fuentes, pro bono director at Jenner & Block.